If you regularly have visitors who are attending group meetings and events, without clear signage showing them the necessary details about current events, they will almost certainly feel somewhat ‘lost’, perhaps they end up asking passers-by or reception staff for directions. Have you ever thought about this? Meetings and events starting late or being interrupted, visitors ‘bailing out’ rather than arriving late, the valuable time they take up asking others who have better things to do, the effect it has on their impression of your organisation? There may be a very similar situation for the hosts of your meetings too – it doesn’t look very good if they don’t know where they are going, does it? 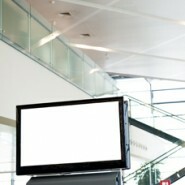 With CABS rolling displays and digital signage solutions, all necessary meeting and event details can be easily displayed at your reception, in open spaces and outside the locations thereby ensuring that everybody knows where they need to be, what time meetings are due to start and end, and even who their host is, if you choose. These displays are automatically updated in ‘real time’ directly from CABS so there is no need for re-keying of the information into a separate system, and everybody is kept informed of any changes even when they are made at the last minute. When combined with our ‘check in/check out’ application the management of the coming and going of visitors and meeting attendees can be automated to save reception staff time and allow them to focus on more important client service requirements. So, whether you are operating a single location or have multiple locations, the CABS Digital signage module will create a professional first and lasting impression for visitors, and make it easier for everybody who needs to locate a meeting or event. Let us know without delay if you think this would be of benefit to your organisation.